Scot McKnight has an intriguing post regarding Sharon Baker’s book Razing Hell: Rethinking Everything You’ve Been Taught About God’s Wrath and Judgment. His article here. After you read these 7 considerations (from Scot’s post), will you please comment here? 1. Theodicy: how does God deal with evil if it, in effect, exists for ever in a hell-state? Does evil not continue to exist, even in spite of the statement in Revelation 21:1-4 that death and suffering will be no more? So, the issue here is squaring God’s goodness with eternal evil. 2. Eternal hopelessness: a traditional hell does not permit any hope after death for anyone, including those who have never heard. Is there a law that says God’s grace can only be active in the temporal sphere — that is, during our physical lifetime? 3. Eternal evil: does not the traditional view entail the view that God never really does purge his world of evil? 4. Justice vs. Love: the issue here is an old one. If God is love, how does justice fit in with that love. Is God ambivalent or split? An image of God that emerges for many is a cruel father who guides people to think of eternal punishment as an act of love. 5. Eternal divine violence: assumptions are that punishment is an act of violence and eternal punishment would mean God is eternally violent. She connects this view of God with acts of violence in history. She thinks God’s violence contradicts God’s love. 6. Retributive justice: again, a major issue is that God’s justice in the Bible — in Christ — is restorative but hell is a belief in a retributive justice that never becomes restorative. 7. Eternal punishment for temporal sin: how can it be just to punish a human being, who sinned temporally — that is over a life time (and no more), for an eternity for that temporal sin? Flying Father God hovers in parallel maneuver with Spirit Dove. Gosh-Nice jammies for Jesus, Mary! Just rub it in why don’t you. I have a body, you have a body, and…..
we’ve gotten used to God (the Father) having one too. “The Man Upstairs” We’ve heard this dysphemism, right? This almighty person* of the three-in-one Godhead, who is the center of Reality, is the One Jesus invited us to respectfully, personally, and literally, address as “Dad” in our prayers. AND-Yes, curiously the depictions appear very much like Father Christmas (Santa Claus). If you think about that bit for too long, it will start to get creepy; especially with those holiday songs that include lines, “he sees you when your sleeping…” and such. Here’s the part where I pop the fantasy bubble, like it or not. That deity in art, and in our minds, looks like a human, and acts as such. It’s human created. The street term sadly, I’m sorry to say, this is, an idol. There, I said it. More importantly to our spiritual growth, those types of pictures of God are bitty and short-changed. 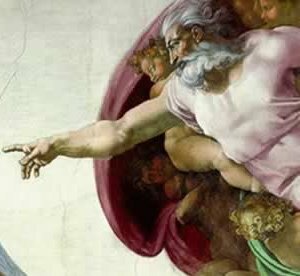 God does not have body parts, or biology to make God one or another gender. Jesus, and others may say “he” for God because it is a term of relationship. It is a gift of grace, goodness, and love toward us (as children) that no human father can accomplish perfectly well. But God can. God displays qualities most often distinctive to both genders respectively, and in perfection and holiness. God is everywhere. Let’s just try to wrap our brains around this a bit, because we are not at all everywhere. I’ll just repeat it: God is everywhere. This is one big benefit a Spirit Being has, someone like “the man upstairs” is only, well, upstairs. And sometimes downstairs, but not both at the same time. This is where Deism is straight out against the Trinitarian percepts of the Bible. Deism, separates God from his creation: God-The Watchmaker. Distant, Aloof. It’s just dead wrong, because Jesus called him Father, and invited us to do so, too. To perform an act of God in the flesh (in human form) Perfect God needed a body. So, yes, God incarnated a real human body to heal and redeem humans, body and spirit. That incarnation: Jesus, the Anointed One. 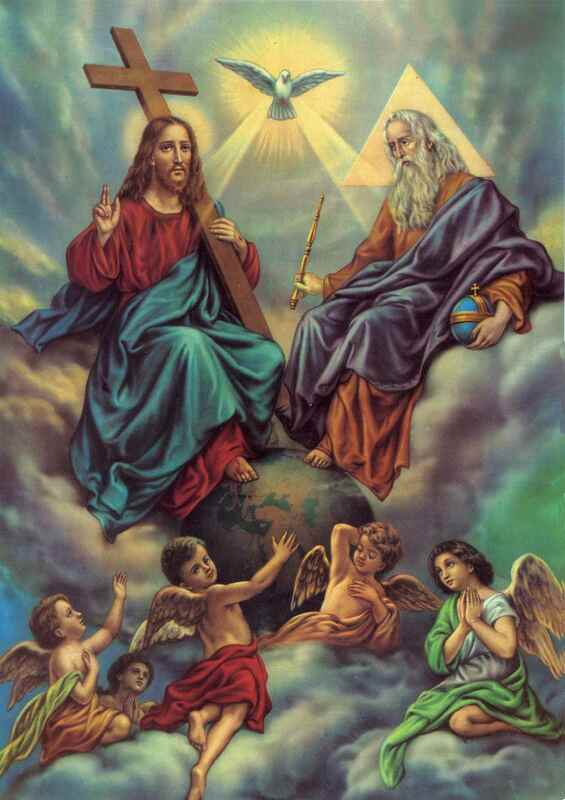 The Holy Spirit, also a full member of the three-in-one Godhead (not just a pale bird in flight above a placid, pasty, bearded white guy often seen in artistic depictions), is the full power of God that is with us who receive God and Jesus. This Being, works on us to teach us, and transform us into Jesus’ character, what we call “Christ-likeness”. In a recent survey, Two out of Three members of the Trinity prefer being body-free. Like me, have you ever thought of God the Father as a man? Or an old man in the sky? Or a Being with a body? How do you image God? 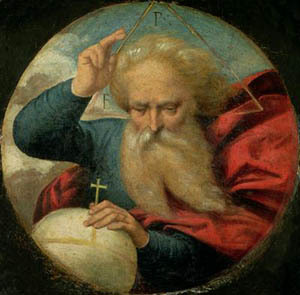 Which artistic depiction of God (shown above) do you find the strangest, or most fascinating? (Nancy Eiesland) ‘The Disabled God’ -How do we define “normal”? Posted on April 10, 2010 | Comments Off on (Nancy Eiesland) ‘The Disabled God’ -How do we define “normal”? 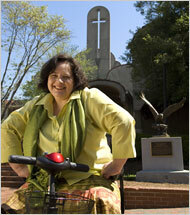 Theologian, sociologist, and author Nancy Eiesland was wheelchair bound since childhood. She surprised many when she said she hoped to be disabled in heaven. She died at age 44 of congenital lung cancer, but not before she made huge inroads for the Rights and Dignity of the Disabled, and penned a groundbreaking book about understanding disability, and suffering, in light of God, and his nature. 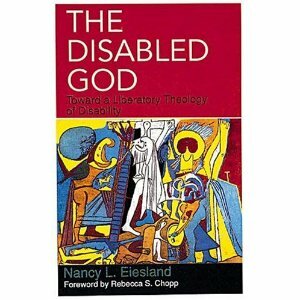 By the time of her death, Eiesland had come to believe God was disabled, a view she articulated in her influential 1994 book, The Disabled God: Toward a Liberatory Theology of Disability. She pointed to the scene described in Luke 24:36-39 in which the risen Jesus invites his disciples to touch his wounds. Comments Off on (Nancy Eiesland) ‘The Disabled God’ -How do we define “normal”? God is love, pure, and holy. Great balls of Fire –where could I be going with this? This will take 2 min and 15 seconds. Hang in there. 1. Grace. Our life in heaven isn’t up to us. We’re not good enough or ready to be with a Holy God. God overlooks this. He, himself paid the debt, to cover over our deficit. Many of us remain awfully content with our goodness, or special knowledge to gain eternal life. But, this life beyond life remains fit as God’s territory singularly. Our residence there is a gift we could never afford. This is what is meant by Saving Grace. 2. Community. Interestingly, atheist Jean-Paul Sartre wrote that, “Hell is other people.” Many of us find being with others (who are not of our own choosing) gets difficult, tiresome, frustrating, annoying, or worse. Even extroverts don’t enjoy communing with every type of person. Some of us get to a point where we consider being with others something to consciously limit, or avoid. Sartre would be very uncomfortable in heaven, would you? God is Trinity, so God in its (pick your pronoun) own Divine essence is community. This is the basis for love-which must have a beloved, or personal recipient of love. And hence, community is the very stuff of heaven. 3. Humility Andrew Murray wrote a wonderful book called Humility: The Path to Holiness. In it, Murray aptly shows how humility was Jesus’ chief characteristic. Jesus was the human face of The Holy God. Jesus was not concerned with being humiliated, and didn’t consider himself above others, but a servant of all. Many of us have quite little of this characteristic that is plentiful in God, and in heaven. 4. Self-absorption Many of us tend to think life, and life after life is about us, and our needs. With this viewpoint, we would be quite out-of-place in heaven. The Kingdom of God is about loving God and others. In doing so, we are found, healed, known, and freed. 5. Idolatry The things that capture our attention, time, and desires are the gods we worship. They can even be good in themselves, like, staying healthy, or being devoted to our children, doing ministry service, or working hard. Whatever we love or enjoy become idols when they possess our main focus. It is our natural bent to allow things other than God, to become first priorities, but it is not good for us. When we have our life ordered properly, everything else falls into place well. In heaven, that will be the case. We will have a chance to learn, and enjoy many things far more amazing than we do in this life. The heavenly, top-down-priority system will likely jar many of us very much for a while. 6. Judging Many of us are not use to leaving the judging to God. As humans we are not in the position to be good, accurate, or fair judges. We are skewed because of our sin, and we are not innocent. However, this doesn’t seem to stop us from doing it to others. We won’t be foolish enough to do that in heaven. The time we typically use to surmise and judge others will be all freed up, leaving many of us feeling quite disoriented, perhaps. This adjustment could take some “time” to get used to. 7. Holy Fire God is good. How grateful we can be for this! But have you ever noticed when righteous people in the Bible meet an angel of God, they flip out, and feel very uncomfortable in the presence of holiness. God is so very good, and so very pure. In this way, God is like a refining fire in the presence of any impurity, or imperfection. Shock and awe, yet all together good. No darkness can exist in God’s Light. It makes one wonder if the course to be made in God’s image (and fit for heaven) will be wonderful… eventually, but the Fire of God’s Holiness will be more of a conflagration, of sorts, during the cleaning process. The process of spiritual growth isn’t for God’s benefit, but our own. All that is not right for heaven will be burned away in his presence, otherwise we really aren’t ready for paradise with him. Some people think, once we are in heaven, we will be instantly and miraculously transformed, and be suddenly fit for heaven. I have thought this, even wished for it. But, I’ve also had to ask myself, “Is it like God to do this? Or, does God most often–for our best interest–allow us to benefit by going through some kind of ‘refining fire’?” Would a shortcut make our characters Christlike and fit for, that is,fully comfortable, in heaven? I’m thinking, probably, nah. A Junior Varsity area might be a good idea. Though we may be forgiven, and allowed admittance to the place where God has prepared for us, I wonder if God will still be interested in continuing to make our character more like his, in a process fashion, not unlike we normally learn, and experience reality. When we see him revealed, we will be like him, for we will see him as he is; that is–knowing we are children of God. Understanding our connectedness. We are relational. But that may, in fact, be a process, and not be something that can or should be done instantaneously. Author and philosopher, C.S. Lewis proposed that heaven could be a place where people would move deeper and further into heaven, and better awareness, as they were able to become accustomed to it. He goes into this quite a bit in his fictitious rendering of heaven in his short book called The Great Divorce. It’s well worth the read. 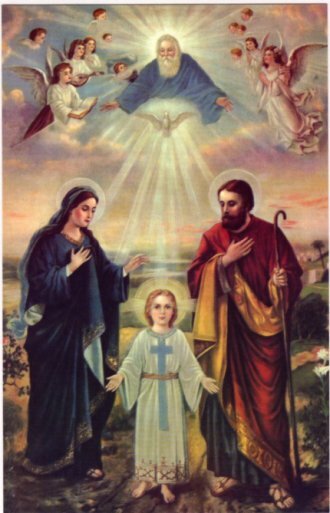 The Catholic idea of Purgatory has a similar notion, of a holding spot, where the heaven-bound are refined in character, and prepared to be with a Holy God, in a holy place, forever. Since I haven’t tried out the place, I won’t make a blanket or dogmatic pronouncement about how heaven must truly be, and how it may work. I’ll find out all too soon–as will you. • God is Holy, and we are not. • We cannot be with God, or in a heavenly place after this life without God mercifully allowing us to be. • We must humble ourselves to our Creator, and be willing to be crafted into God’s divine character. Please leave your thoughts, of any kind. Thank you for visiting today. I invite you into a short spiritual exercise of prayer and meditation. (It takes 2.5-4 min.) Simply read over the following almost 1,000 year old prayer, about 3 times, (preferably out loud-even a whisper is fine). Each time think carefully, for 30 seconds or more, about something in the passage that stands out to you, before you re-read. Then, speak with God for a few minutes about the thoughts that came to mind. Your comments, or reflections about your experience, or this prayer are quite appreciated. Thank you, and happy Advent Season. Holy Bible: Mosaic, Tyndale Publishing, 2009.
govern all things, world without end. Amen. This view allows for much individual choice, values, and ethics, and nothing much in the way of a deepening relationship with the Creator. It actually reminds me of how a child grows up. First, as a baby, the infant knows that something feeds him. After a while, he understands that certain things he does may cause certain needs or wants to be fulfilled. A little while later, the child comprehends that he has a person caring for him. Only much later does that child really respond to the parental love in any kind of reciprocal way, let alone, show much unselfish kindness to the parent. This is a good picture of the journey of spirituality, toward the heart of God. Well, all that dialogue in the last post has made me quite hungry. Everyone who knows me will tell you I have more than one sweet tooth. Bill has really inspired me to rethink me habits, and consider name-calling as an evangelistic “technique”. As a dry run, I’ll probably just start with snarky sarcasm, as it has served me quite well in the past, if only to avoid growing hopeless. No, I’m joking. I won’t really go down that road too far. I’d like to thank all the people who posted, and others who may join in later, and of course all who visited just to read, chuckle, or wipe the tears away as they realized the state of Christianity, or remembered being treated badly by Christians. So, after all this you might be wondering, as I have been, what on earth, or what in hell, do children of the devil eat? I mean primarily (besides sulfur, of course). It’s really the burning question, isn’t it? Well, the answer has been right in front of most of us all along. Cake. Devil’s food cake. I found this recipe in Bill’s underwear drawer, but trust me, he’ll deny the whole thing to his grave. This recipe is down right sinful. Holy Rollers, God-fearers, and agnostics alike will agree, if you like chocolate, and fudge, this will be your guilty pleasure. The following is a recipe for devil’s food cake with cocoa and fudge frosting, not the picture shown which came from here. I’ll just finish off with one more thing. Let’s enjoy each other, enjoy this beautiful world, and enjoy God. Let’s act and be beautiful to each other. Life is too short to waste on things that take away from God’s gifts. I welcome dissenting viewpoints and comments from any visitor. Keep the posts coming. (And please read the guidelines on “The Skinny” page) The page called The loop is the contact page. Blessings all. Grease two 9-inch layer cake pans and line bottoms with wax paper. Grease wax paper. Sift the cocoa with 1/3 cup sugar; pour into the milk gradually; stir until well blended. Set aside to cool. Sift together flour, remaining 1 cup sugar, soda, and salt. Add shortening and half of the cooled cocoa and milk mixture. Beat at medium speed of an electric hand-held mixer. Add eggs, vanilla, and remaining cocoa and milk mixture. continue beating for about 2 minutes, scraping bowl with a spatula occasionally. Pour into prepared pans. Bake at 350° for 25 to 30 minutes. Cool in the pans for 5 minutes; turn out on racks and peel off paper. Cool and frost devil’s food cake as desired. Chocolate fudge frosting recipe is cooked to a fudge consistency. In a large saucepan over medium heat, combine sugar, corn syrup, milk, and chocolate; stir to blend well. Cook, stirring occasionally, until mixture forms a very soft ball when a small amount is dropped into cold water, or about 232° on a candy thermometer. Remove from heat; add butter without stirring. Set aside and let cool until bottom of pan is lukewarm, about 1 hour. Add vanilla and beat until frosting is creamy and just begins to hold its shape. Spread quickly on cake before frosting hardens. Makes about 2 cups.